Right now and for the next three/three and a half months, it is awards season. Specifically, Hugo Awards Season. This year's nominees were announced on Saturday, and since then, many of the places I hang out have been abuzz. Yes, yours truly also contributed to those 1813 valid nominating ballots. I've been voting and nominating for a few years now, ever since the, shall we say, Kanine Kerfluffle of a while back. This sordid tale of right-wing hijacking of the awards is old news, and something I don't particularly wish to rehash. Suffice to say that the impact of those Constipated Canids has pretty much faded away, and the awards are back to normal. There's a strong ballot on tap this year, a decent portion of which I have already read, and I've begun working on the rest. To that end, all of my next several weeks of reviews will be focused on the Hugo nominees. Some of this is stuff I already own and am simply pushing to the top of Mount TBR (which, as any dedicated bibliophile knows, is threatening to reach Everest-sized proportions); others I have begun checking out from the library. I will do my best to finish as much as I can so I can make an informed decision, but as anyone who looked at the list of this year's nominees can see, the sheer numbers involved, especially with the new Best Series category, is pretty daunting. Nevertheless, this reader will persist. 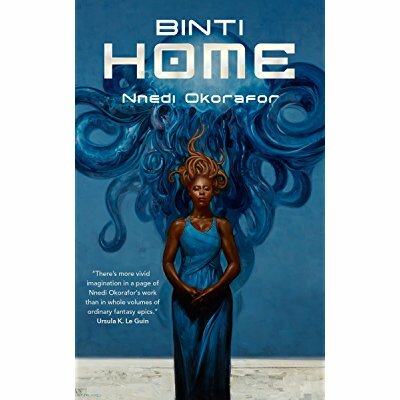 We begin in the Novella category, with the sequel to last year's Nebula and Hugo winner Binti, Nnedi Okorafor's Binti: Home. After finishing this, I went back and reread the first novella in the series, Binti. Unfortunately, it doesn't hold up as well as I hoped it would. My main complaint is that the worldbuilding is sketchy, a problem that's not really rectified here. Clearly the author wanted to take a deep dive into the culture of her two tribes, the Himba and the Khoush, and how they fit into a future Africa. Which is fine, and she does a good job of it. However, to me this focus is too narrow--the bigger picture of this future Earth, its technology and history, is simply not there, and the few hints we have just sort of stick out like sore thumbs without context. Also, the characterization is not satisfying, particularly of the protagonist. To put it bluntly, if I was Binti I would resent like hell being injected with alien DNA and having my body modified without my consent, even to prevent a war; and I certainly wouldn't have anything to do with those who did the injecting afterwards. (Especially since said alien race, the Meduse, murdered scores of people aboard Binti's transport ship, which is not dealt with well at all.) This unsettling relationship between Binti and the Meduse Okwu carries over into this book, as Binti and Okwu return home to her tribe and family and all sorts of complications ensue. This is just....not the story it needs to be, as far as I'm concerned, and it will probably be placed towards the bottom of my ballot.